Robin Burks | Glorious Food And Churches! My third day in Germany began once more with cheeses, meats and breads for breakfast with the intent of spending the morning doing the outside touristy stuff and the later part of the day doing museums, as temperatures were set to hit 88 degrees here. And well, in my book, that’s hot. But what was really cool about the building? 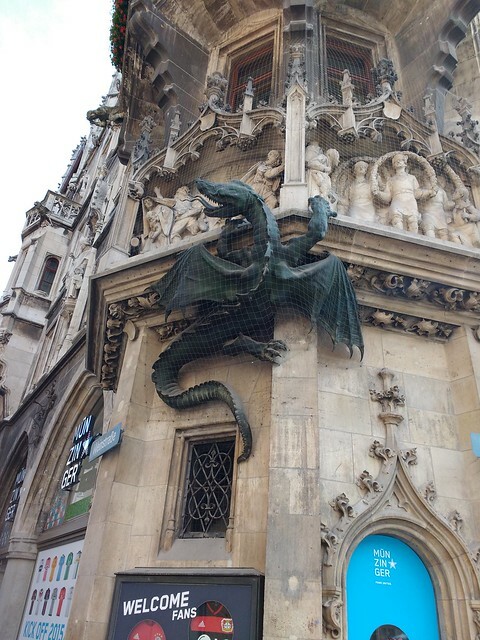 IT HAS A DRAGON! Germany really is the land of fairy tales, right? So after I geeked out over the dragon, I walked over to St. Peter’s church. Unfortunately, though, there was a service going on, so I didn’t really get to see much of it. So I wandered over to Frauenkirche instead, which was also a disappointment because most of its clock towers are under construction and much of the church was covered in an ugly tarp. It was pretty inside, though. 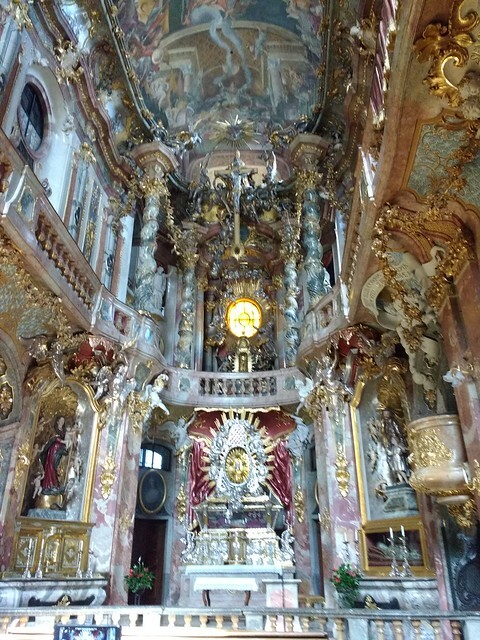 But then I remembered that the tour guide from the Neuchwanstein tour mentioned that Ludwig II and much of the royal Bavarian Wittelsbach family were buried at St. Michael’s, and that church did not disappoint. I paid my respects to Ludwig II, who I’ve learned much about these past few days. It was his imagination that inspired Walt Disney, after all. I also went to Asamkirche, which is this small church, but what it lacks in size, it makes up in Baroque-ness. Like OVER THE TOP baroqueness. I tried to sit there and take it all in, but it was honestly a bit much. But it was still interesting. Of course, by that time, I needed sustenance. 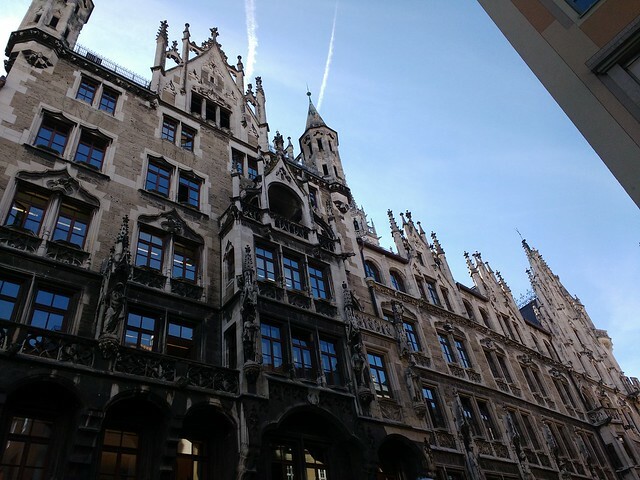 So I headed back to the Marienplatz (the main square in Munich) and ate at the Ratskeller. I ordered a pint of Radler (which was excellent) and had sauerbraten, which is a traditional German pot roast served with a ball of mashed potatoes and red sauerkraut. It’s official. I love German food. Sated, I headed back out and checked out the interior of the Rathaus, which, apparently, anyone can do. Yeah, some rooms are off limits, but they still let tourists wander around. 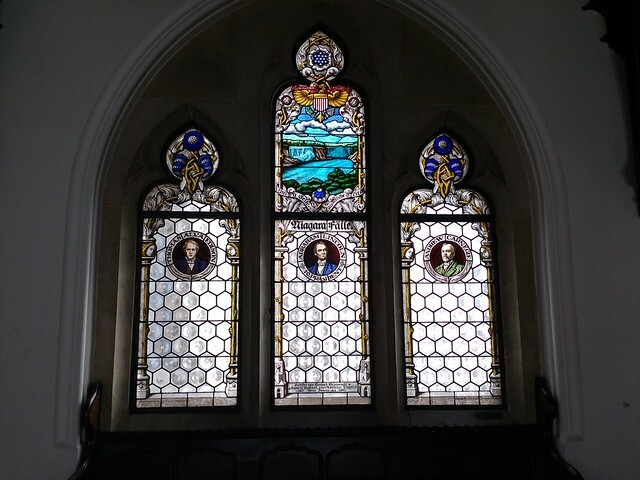 It was really interesting to see several stained glass windows dedicated to Americans. I’m going to have to research their importance to Bavaria (maybe they’re of German descent?). It’s a beautiful building inside and out. 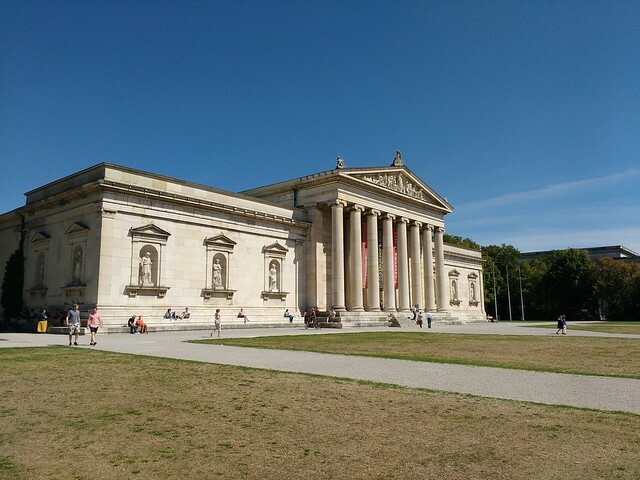 But then it was getting warm out, so I hopped on the U-Bahn and headed to the Glyptothek and Antikensammlungen: two museums full of ancient Greek and Roman antiquities. And if you’ve read my books, you understand my interest in ancient Greece and Rome. I also wanted air conditioning. However, I didn’t feel any actual air conditioning at either museum. Just open windows and de-humidifiers. I get that the room’s must stay at a certain temperature, etc., but shouldn’t that temperature be cooler? So I sort of zoomed through the museums, because it was actually nicer outside in the shade of the Antikensammlungen, just sitting on the steps. I stayed there awhile, enjoying a nice breeze and cooling off. I did end up going to the cafe at the Glyptothek, though, because I needed water, so I also ended up with kuchen, aka cake. But, eventually, the heat got to me, so I hopped on a tram, which was a HUGE mistake because it was hot inside (no a/c and lots of windows). But I made it back to my hotel, which also doesn’t have a/c, but my room stayed surprisingly cool. I took a quick cold shower and cooled off, but I eventually got hungry again around dinner time. It’s all the walking, right? I walked back to Hirschgarten, where I had pork schnitzel with pomme frites AND a dessert called Dampfnudel, which is a sort of cake thing swimming in vanilla cream. I also drank a glass of wine (but also water) and now I’m questioning my life choices. But there’s no time for that! Because tomorrow, I head to Salzburg for an evening, where I will see my first world class opera production.